Our blue Royal Victoria hinged trinket box is exclusively available from Historic Royal Palaces for your collection. The blue and gold design is inspired by one of the crowns worn by Queen Victoria which can be seen at the Tower of London. The crown became part of Victoria's image in the later years of her reign, despite it's small size it still contains 187 diamonds. Made from bone china, this 5cm diameter trinket box has a hinged lid making it perfect for keepsakes and small valuables. Made from bone china in the UK exclusively for Historic Royal Palaces. A delightful trinket box where the design is inspired by one of Queen Victoria's small diamond crowns. The crown was specially designed for Victoria after the death of Prince Albert so she could wear a crown with her mourning veil. 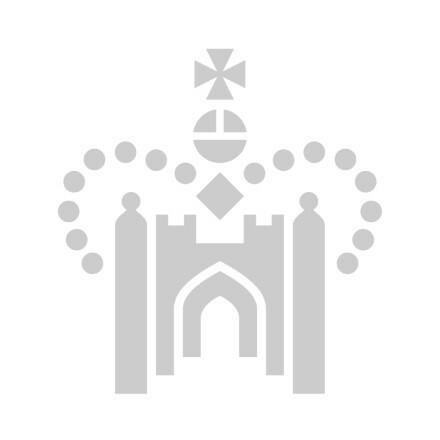 The crown can now be seen at the Tower of London. The trinket box has a hinged lid and is a perfect size for storing your own small valuables or to be a wonderful trinket in its own right. Our Victoria trinket box is from our Royal Victoria range and is available only from Historic Royal Palaces. Exclusively available from Historic Royal Palaces. Made in England, UK, from bone china. Trinket box dimensions: 5cm x 5cm x 5cm.